The old and fat birds easily get over, even should the river be a mile in breadth; but the younger and less robust frequently fall into the water, - not to be drowned, however, as might be imagined. 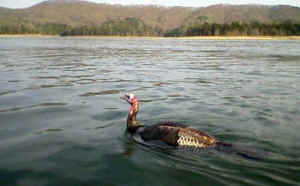 They bring their wings close to their body, spread out their tail as a support, stretch forward their neck, and striking out their legs with great vigour, proceed rapidly toward the shore; on approaching which, should they find it too steep for landing, they cease their exertions for a few minutes, float down the stream until they come to an accessible part, and by a violent effort generally extricate themselves from the water. – John Jay Audubon, 1831. 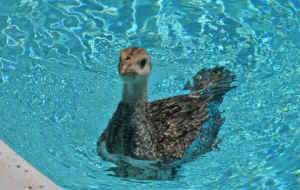 Poults [very young turkeys] swim surprisingly well. The attempted crossing of the Iowa River, where it was one hundred yards wide, by poults only a few days old, was witnessed. The hen flew across the river and, in response to her loud calls, twelve to fourteen young ran quickly down the bank and entered the water. Just before they reached the opposite bank the hen became frightened and, giving the alarm notes, flew back across the stream. The poults immediately turned back. On reaching the strongest part of the current, about half of them gave up and floated with the stream. These young were rescued from a boat and released after they became dry. 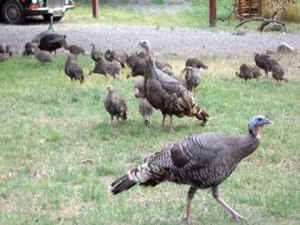 This family of wild turkeys shares the land with Gay Bradshaw and Jeff Borchers in Jacksonville, Oregon at the Kerulos Center of which Dr. G.A. Bradshaw is the Executive Director.